In your introductory astronomy course, you probably learned that elliptical galaxies appear red in color and that spiral galaxies appear blue (but see this astrobite). 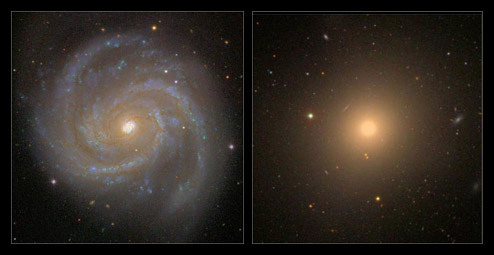 The color difference is due to the lack of young stars in elliptical galaxies and the presence of hot massive stars and ongoing star formation in spiral galaxies. Although both low-mass and high-mass main sequence stars are born during star formation, the hot massive stars shine more brightly than the cool low-mass stars causing the galaxies to appear blue in color because the radiation emitted by hot massive stars peaks at blue wavelengths. The accepted explanation for the dearth of star-formation in elliptical galaxies is that elliptical galaxies have very little gas and dust and therefore don’t have enough starting material to form stars. Since these galaxies are reddish in color and are no longer forming stars, astronomers often refer to them as “red and dead.” In this paper, however, the authors find signs that elliptical galaxies might not be as dead as we’ve assumed, hence the Monty Python allusion in the title of the paper. Watch this clip if you don’t get the reference or if you have time to spare. Returning to the science, the authors observed 16 elliptical galaxies using the Hubble Space Telescope and found that elliptical galaxies appear to be shrouded in clouds of cool gas despite the low abundance of gas in the interiors of elliptical galaxies. Intriguingly, the total mass of circumgalactic cool gas found around elliptical galaxies is comparable to the mass of circumgalactic cool gas observed around spiral galaxies. The presence of so much cool gas on the outskirts of supposedly “dead” elliptical galaxies is perplexing because the standard model of galactic star formation implies that both galactic and circumgalactic cool gas reservoirs are depleted when star formation ends. 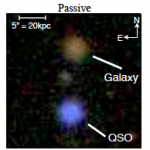 One of the galaxy-quasar pairs. A subset of Figure 1 from Thom et al. 2012. In order to probe the circumgalactic environments of the galaxies, the authors took spectra of nearby quasars using the Cosmic Origins Spectrograph. Because the quasars lie behind the circumgalactic environments of the galaxies (see figure at right), the light from the quasars passes through the circumgalactic environment of the galaxy en route to Earth. If the circumgalactic environment contains gas, then the gas will absorb the light at the wavelengths of atomic transitions and the presence of the gas will be revealed by the appearance of absorption lines in the spectrum of the quasar. In this study, the authors measured the widths of the Lyman series absorption lines of hydrogen, which are formed when neutral hydrogen transitions from the ground state to an excited state. The authors then used the strength of the absorption lines to determine the number density of neutral hydrogen atoms and the width of the lines to estimate the temperature. Since some of the hydrogen is ionized, the authors divided the number density of neutral hydrogen by the ionization fraction in order to find the total mass of the circumgalactic gas. 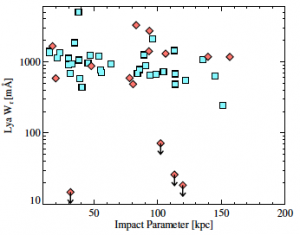 Equivalent Width of Lyman alpha versus impact parameter (projected separation between the quasar and the galaxy) for elliptical (red) and spiral (blue) galaxies. Figure 2 from Thom et al. 2012. 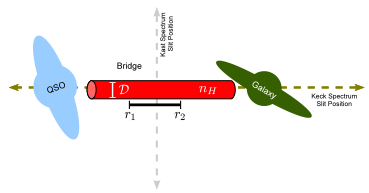 As shown in the figure at left, the authors did not detect a significant difference between the equivalent widths of Lyman alpha (the ground state to first excited state transition) hydrogen lines for spirals and elliptical galaxies. They were unable to detect Lyman alpha for four of the elliptical galaxies (the points marked by upper limits), which hints that some elliptical galaxies might lack circumgalactic cool gas. The authors do not yet have enough data to argue for a difference between the circumgalactic cool gas abundance between spirals and elliptical galaxies or between different sub-classes of elliptical galaxies. 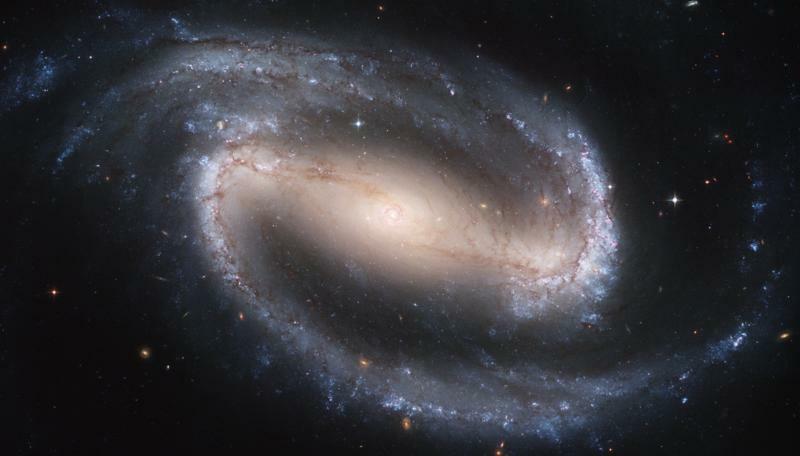 The results of their statistical tests indicate that the equivalent widths found for the elliptical galaxies and those for the spiral galaxies are consistent with being drawn from the sample population. The discovery that elliptical galaxies have significant quantities of circumgalactic cool gas indicates that either the circumgalactic cool gas was never fully depleted or that the reservoir has been rebuilt. If the second explanation is accurate, then the reservoir of circumgalactic cool gas might have been rebuilt as hot gas from the halo of the galaxy cooled down or as gas fell in from the intergalactic medium. Alternatively, the cool gas could have been ejected by supernovae within the galaxy. The authors withhold a detailed discussion of these different theories for a longer paper (Tumlinson et al. 2012, in prep), but the bottom line is that quenching star formation is less clear-cut than astronomers had previously assumed and that not all red ellipticals are really dead.